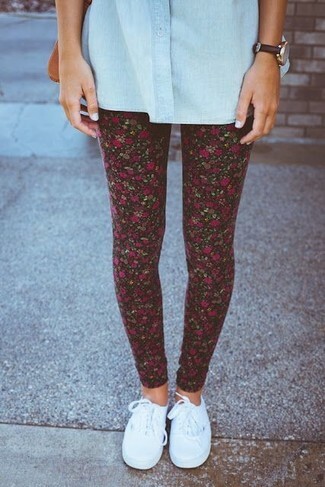 For something on the casual end, make a light blue denim shirt and black floral leggings your outfit choice. A pair of white canvas low top sneakers integrates perfectly within a multitude of getups. The mix-and-match capabilities of a black and white print tank and black floral leggings mean you'll have them on high rotation. Finishing with black and white canvas low top sneakers is a surefire way to inject an added touch of class into your look. If you appreciate function above all else, wear a black leather biker jacket with Philipp Plein Couture Leggings. Show off your elegant side by finishing with tan leather pumps. For a laid-back look, Opt for a burgundy vertical striped sleeveless top and Philipp Plein Couture Leggings. Dial down the casualness of your look by rocking a pair of navy leather heeled sandals.